The Keep is a small and stylish B&B centrally located in beautiful St Ives, just 50 yards away from fabulous Porthmeor beach and less than a minute's walk to the Tate and Town centre. The guest accommodation is in a converted former Pilchard Palace harking back to the town's important history as one of the largest fishing ports in Cornwall. The rooms are furnished with king-size Lombok hardwood beds; each room has its own spacious walk-in drench shower. The Keep has been awarded a Certificate of Excellence from Trip Advisor for every year it has been open. There are no rooms available at The Keep for these dates. Parking: Parking for all guests is available on site at a charge of £8.00 per day. Hospitable, helpful, friendly and professional. If following satnav, arrive after 4pm to take the more scenic route to the Keep. The Porthminster Kitchen, the Captains Table at the Sloop and the Porthgwidden Beach cafe. The Tate/ Hepworth walking tour and the main galleries. We stayed for two nights and were bowled over by the accommodation, which is spotlessly clean, with everything you could require. Lots of lovely touches, including chocolate biscuits, real milk and a variety of teas and coffee...not to mention chocolates on the very comfortable bed. The added bonus of a separate dining/lounge adjacent to the bedroom is lovely. The breakfast was fantastic, with loads of choice as well as a daily special. Add to this the delightful, friendly and helpful hosts Michael and Carol....plus puppy Miah!! and you have in our opinion and an absolutely standout B and B situated within a few 100 feet of the harbour. The adjacent covered car parking at an additional £8 per night is also great value and convenient. Thank you for a lovely stay. I am sure we will be back. We had a great stay thanks to wonderful hosts and fantastic premises. We wouldn’t stay anywhere else in St Ives. I can not fault The Keep at all, Carol and Mike made me feel extremely welcome and the accommodation is beautiful. My stay was very comfortable and very quiet and the breakfast and coffee was excellent. 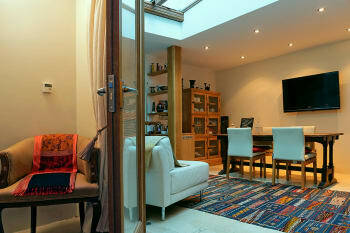 A wonderful hideaway in the perfect location, with parking which is a rare find in St Ives. Carol and Mike were the perfect hosts who went out of their way to make our short stay as comfortable as possible. We were made to feel more like friends than guests. The breakfasts were delicious and beautifully presented. Definitely an all round 5* experience. Really good welcome and you looked after us very well, no gripes at all...and the location, room, garaging, breakfast etc was all ideal for us. Thank you! Only stayed for one night but a truly memorable experience. Probably best overnight stay ever. Very helpful host, first class breakfasts (11/10)!, great location and very quiet. Comfortable bed and very good bathroom and shower. Porthminster beach cafe and Porthmeor beach cafe both excellent, pasty shop at end of the Digey makes delicious pasties and several great fish and chip places - what’s not to like? Tate St Ives - alright if you “get” modern art- which we don’t! Absolutely perfect, nothing to fault ,wonderful hospitality, spotless, excellent choice of breakfast,can’t wait to return next year .Mike and Carol are a great team! Make the most of the lovely walks,you will get wonderful views of the coastline etc.Try the local gin it’s delicious.Recommend The Loft Restaurant ,also The Cellar Bistro but book as very popular and busy especially weekends ,look out for the seals in the harbour by Smeatons Pier ,above all respect and treasure this magical place ! Wonderful service provided - above and beyond what we expected. Had a lovely time, would recommend and would stay again if we come that way. Amazing hosts who couldn't do enough for us. Lovely accommodation in heart of St Ives and scrumptious breakfasts. Recommend Cellar Bistro and The Loft for meals. Slippery Eel for fish and chips. We loved our stay here Mike and Carol did everything they could to make our stay comfortable . The breakfasts were excellent and they catered for every need as my husband and granddaughter vegetarian they sent out for veggie sausages ,nothing was too much trouble , Excellent hosts . It is so central for all you need when on holiday , the beach , the shops ,the art galleries and some lovely beach walks . Restaurants that are good and close are The Loft and The Porthmeor Cafe . Carol and Mike were the most perfect hosts. We enjoyed our stay so much. We were only in St Ives for a short stay but we have enjoyed a great deal of walking. Paul and I had a wonderful stay at The Keep, we were bold over by the beautiful decoration and facilities that we had the use of and wished we had had a longer stay. Our hosts were delightful, friendly and helpful, it was also great to have a very close and safe garaging for our car. We would fully recommend this excellent and friendly Bed & Breakfast if you plan to stay in St Ives. We loved your attention to detail and willingness to go the extra mile for us. Thanks Mike and Carol for the tip to book dinner at the Porthmeor cafe in one of their pods. It was a great meal. We loved the quirky character of The Keep and enjoyed the comfortable bed as well as your special breakfasts. Super location despite the tricky access. Parking was a bonus! Hope to see you in New Zealand in the near future. Tate gallery. Porthmeor cafe. Lands End. Minack Theatre. Mike and Carol are both excellent hosts, we felt welcome from the moment they opened the door. A fantastic room and breakfast each morning was so beautifully presented. We both can’t wait to be back! Thank you for such a lovely stay! Brilliant b and b, situated close to Tate St Ives and lots of restaurant. Wonderful friendly hosts, and great breakfasts. A lovely and perfect place to stay! When I think of my stay in The Keep, I can only think in superlatives. The Keep was just simply wonderful , everything about it was purfect . It was Immaculately clean and had a real cosy feel to it , a real delight . Location wise couldn’t be better a short stroll from the beach , reastaurants and shops and the hosts carol and mike were so friendly and welcoming and nothing was too much trouble . I would give this little piece of heaven a 10+ out of 10 . Lovely place and lovely people. Thanks for having us. A lovely relaxing stay. Superb breakfast. Most welcoming hosts. Fantastic hosts, extremely welcoming, friendly and knowledgeable with local attractions and places to eat. The accommodation is beautiful and comfortable. The choice of breakfast is very good and with a specials board added! I would be happy to stay again when I next visit. I was only visiting for a few days so my time was limited, but I would recommend The Tate St Ives Gallery, apart from some fantastic artwork the view from the balcony is also breath-taking! Purchase a joint ticket to the Barbara Hepworth museum and sculpture garden, pictures do not do it justice! To dine, try The Loft, Norway Lane. The restaurant has a lovely view of the sea and provided beautiful food, freshly cooked. The staff were very friendly and attentive. Also, The Cellar Bistro, Fore Street. A good choice of menu and again tasty fresh food, with attentive staff. St Ives also has a great range of shops and galleries with everything being easily accessible. very welcoming and informative always asked if there was anything we needed. We had a lovely two nights at the Keep. It was perfectly located to enjoy St. Ives, and Carol and Mike could not have been more welcoming and helpful. The accommodation is very comfortable and tastefully furnished and decorated. The breakfasts were great and we enjoyed chatting with our hosts. We will definitely be coming back, we highly recommend a visit. We enjoyed dinner at 'the Loft' and the 'Porthminster Kitchen', both were very good. You were the perfect hosts and did everything to make me feel welcome and comfortable. I loved the building and the stylish interior. The bed was extremely comfortable and my breakfasts were absolutely delicious. Having the specials was a treat. As I had limited time I only ate at the cafe Pasta and The Loft. Both near and excellent. Tate St Ives and the art galleries. Personal richy provided by Mike and Carol added to the great experience. Worth 5 star on all levels. And the breakfast waxh day was sublime. See you again. Really great B & B. Fab hosts, in a perfect location. A day in St Ives is not long enough! An absolutely gorgeous place to stay in a fantastic position, with secure parking just moments away. Carol and Mike are terrific hosts and could not have been more helpful and friendly. Breakfast was superb with lots of choices. Tate St Ives is literally just around the corner and the Porthmeor beach Cafe is a must. This was a wonderful place, elegant, high end, and superbly quiet and yet right in the middle of St Ives walking distance to everything from harbor to shopping to the Tate. Supremely friendly and helpful hosts. Feel pampered in every way. Your hosts can recommend the best. The pods at the Porthmeor Beach Cafe were amazing, as was the food. Definitely make a reservation. Alba was a nice place for drinks. And don't miss the seals at Godrevy, which is why we went. Our stay at The Keep was delightful. We were made extremely welcome, the accommodation was first-class, and our breakfasts were nothing short of spectacular. The decor is lovely throughout and the premises are very clean and well serviced. Carol and Mike are super hosts who looked after us wonderfully. Top marks! St Ives is a town full of interest. We particularly enjoyed The Tate. We also found the Porthminster Beach Cafe to be particularly good. Accommodation and hosts were excellent. The keep is in an excellent location to visit the beaches shops and restaurants. Breakfasts are amazing and I can highly recommend staying here for anyone visiting St Ives. The food at caffe pasta is excellent. The beaches of Porthmeor and Porthminster have golden sands and are stunning. I would recommend heading up to high points on the cliffs for breathtaking views. (Halfway through writing a review and the page disappeared so apologies if this looks like a repeat)... Tucked away in a whitewashed courtyard, minutes away from turquoise waves crashing on to beautiful sandy Porthmeor beach, The Keep is a perfect haven of calm and comfort. Step outside and you are in the narrow streets and alleyways of old St Ives surrounded by the history of fishing and artists. Just minutes away from the Tate, the Island, the beaches, the harbour and town, the last thing you need is a car, so it is a wonderful bonus to have a garage next door. Mike and Carol are perfect hosts, friendly, engaging, good fun and highly professional- the breakfasts were delicious. Thank you for everything - I look forward to returning. You are two minutes away from Tate so get there early when it's still quiet and enjoy the new display of modernist artists who lived and worked here. Plus the cathedral-like new extension, excavated from deep into the hillside. There is a huge choice of cafes for coffee and lunch...one of my favourites is on Porthgwidden beach. For evenings a cocktail overlooking the harbour and then my favourite restaurant is The Black Rock. Remember to book a table. Staying in The Keep is an absolute treat. The quality of service that Mike and Carol provide is of the highest standard. The decor and ambience is perfectly relaxing and chilled while also being a beautifully designed conversion of a charming old house in the centre of St.Ives. You are right in the middle of town, but tucked away so that it also feels peaceful and relaxing. The breakfasts are legendary and Carol and Mike are brilliant hosts. Go to Barabara Hepworths garden, The Porthmear Beach cafe and a lovely walk around the town. Or just sit and watch the sea! A delight to chat with. Excellent breakfast. Service was impeccable. Carol and Mike are wonderful caring hosts. They make the Keep perfect by being helpful and friendly but always discreet. Their B&B is quite magical and in a fantastic location. I felt at home straight away. I liked particularly the Breakfast fairies who crept into the dining area so we emerged to a wonderful spread each morning. Amazing how they did it so quietly. Definitely by magic. Just ask Carol! We had great meals but it's best to book well in advance as restaurants all seem very busy. The Keep has a fantastic location in the heart of town easy for so many places. Barbara Hepwortth's home and now museum, is a must! Lovely and friendly hosts, excellent accommodation and superb location. Plenty to do around St Ives or do explore Newquay and Penzance. Local village just outside the resort called Carbis Bay has a great beach and is quieter and easily accessible by train or on foot. Much more than just location/ location/ location! We felt the accommodation, service, food & above all our hosts far exceeded our expectations. Loved the contemporary style of the place & the care gone into ensuring guests got the most out of their stay. We would not hesitate to stay again or recommend others to choose the Keep . Fantastic hosts, beautiful rooms and very close to the harbour and amenities. It is a holiday of your own pace and time and is very enjoyable! Pednolva hotel and the beer and bird are great places to eat! Wonderful food! Go for walks along the coastal paths they have beautiful sites, and walk out past carbis bay away from st Ives for lovely views and slightly quieter/different beaches! Carol and Mike are a lovely couple and made us feel welcome from the moment we arrived. We enjoyed chatting to them during our stay and they were very helpful with directions and advice on places to eat/things to see. They were also very good about ensuring our privacy. The Keep is more akin to a boutique hotel with the added bonus that you will have it completely to yourselves. Carol and Mike run it expertly and this is evident in everything from the gourmet breakfasts to the stunning rainshower in the bathroom. I have been reviewing hotels as part of my job for nine years now and though I stayed at The Keep in purely a personal capacity, reviewing Carol and Mike's B&B would have been a pleasure. There really is no where else you need to look if you are planning a trip to St Ives. Five stars, we'll be back. Book the car parking space offered by the B&B, it cuts out all the hassle of having to drive around finding a space (near impossible). We were so glad we had reserved it once we saw how crazy busy the St Ives' streets are. We had dinner at the Hidden Kitchen, Portminster Kitchen and Porthmeor Cafe during our stay, and would highly recommend all three. Take Carol's advice and book all in advance, otherwise you will be disappointed. We visited the Eden Project, the Barbara Hepworth Museum and Gardens, and the Tate. We also had a lovely walk up to St Nicholas' Chapel, which will give you a reprieve from the peak season crowds on the beach below. You are totally committed to providing a professional service while at the same time helping your guests to feel relaxed. The facilities and food are 5-star. The B&B is very conveniently placed within easy reach of the harbour, main shopping street, Tate Gallery, museum and three of the four St. Ives beaches. Perfect! Best B & B ever . Carole & Mike are the best hosts you can imagine. Excellent breakfast . We loved staying here . Service was excellent and very personal. Nothing is left to chance. We rented a car in Penzance and the Keep rented an indoor parking space for us next door. The owners provide detailed information on restaurants and attractions. Wonderful hosts, fab breakfast and always welcoming. Book pod at Porthmeor beach half an hour before sunset. So much to do but Kayaking with Koru kayaking and trip to Trebah gardens right up there. Carol and Mike are fantastic hosts, As a third time visitor to St Ives this will be my number one choice going forward. The location is perfect as is breakfast. The real treasure here though is the people running the B&B! Cheers! Had a lovely meal at The Seafood Cafe. Carol and Mike are brilliant hosts; friendly, professional and informative. However, they respect your privacy and whilst we were there we treated The Keep as home from home. Location of The Keep couldn't be better as it's right in the heart of St Ives. The place itself is clean, stylish and has everything you need. The breakfasts were incredible and set us up nicely for the day. The tea/coffee making facilities were also perfect as we popped back at regular intervals for a pit-stop. We couldn't recommend The Keep highly enough and can't wait to come back. Just wander out the door, turn left or right and everything is on your doorstep. Mike recommended The Hidden Kitchen restaurant in town and this is a brilliant, unassuming little bistro with a small but delicious menu. For a more traditional eatery, The Mermaid is spot on and literally a 2 minute walk away (sorry Carol hehe). Wonderful hosts! A pleasure to stay at this fun place. The Keep is beautifully presented, and Mike and Carol are so warmly welcoming and attentive to making your stay the best it can be. There is a full Breakfast Menu, but Carol's daily specials are an absolute delight! Close to St Ives School of Painting, and with parking, The Keep is so quiet, and relaxing. Perfect. Thank you both. Mike and Carol have great tips for eating out, and I took their advice and was not disappointed. Always best to stay current, so best ask them when you visit. Carol and Mike were amazing hosts - so friendly, and gave us some excellent recommendations on what to do and where to eat. Highly recommend staying here!! Book a pod at the Porthmeor Beach Cafe - we had dinner there over sunset and it was amazing. Carol and Mike are fabulous hosts. They are extremely helpful with just everything. 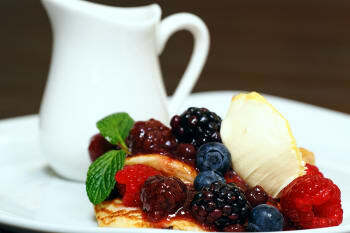 The breakfasts are very high quality and they cooking and style is worthy of good resturants breakfasts. The rooms are interesting and very stylish. 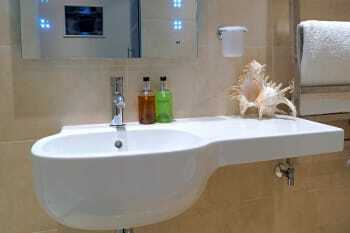 bathrooms are spotless and modern. I have read many positive reviews which I agree with and find it difficult to add to. The Keep reminded me of a riad I stayed in in Marrakesh, an oasis within a maze of beautiful narrow streets and yet a stone's trow away from the sea. Mike and Carol have a passion for what they do and where they live that is infectious. Lovely room and a good choice for breakfast including delicious daily specials. Carol was most helpful for any special diet/health requests too. A well positioned place to see everything and a lovely retreat to be tucked away at the end of a busy day. You have skills and talents which enable you to do things differently and beautifully. A rare find indeed. Close to some of the best eating places on the planet and of course the incredible coastline. Couldn't have wanted better. Staying at The Keep is like being at home. A lovely bedroom with very comfortable bed and great shower in the en-suite. Private use of breakfast/sitting room with large TV and DVD player (TV and DVD player in bedroom too). Really good WiFi - essential to me as I needed to work whilst there. Breakfasts were amazing and different each day. Felt really welcomed and looked after by Carol and Mike who were on hand when needed but were never intrusive. I booked this on the spur of the moment because it was convenient for my business appointment a few hundred metres away, and I'm glad I did! The owners Carol & Mike were welcoming, friendly and helpful, the room was by far and away the best B&B I've ever stayed in, better than most hotels for sure. Great location near shops, restaurants, sea, etc. Nearby car parking as well if required (unique for St. Ives). Superb, highly recommended. Very narrow streets in St. Ives, so take care travelling to location - made for an interesting journey in my big 4 x 4! Main street a few hundred metres away, plenty of selection for eats, etc. Everything that I hope for - and very rarely find at hotels: Quite. Super comfy bed. Perfect temperature. Beautifully presented room. Amazing Breakfast! Thanks again Carol and Mike. Parking is St Ives is tricky. Contact Carol or Mike for advice. Coastal walks After half term in October many restaurants etc are not open in the evenings. Hope to stay again - we loved it! Visit the Pilchard Press micro-pub for great beer, good value and great atmosphere. This unique place is a gem, it exceeded all expectations. From the moment we booked we received outstanding service from emails with very useful tips and instructions. Nothing was too much trouble for our stay. The room was immaculate, luxurious and comfortable. The breakfast standard was 5 star. You will not be disappointed. The owners were so helpful, friendly and accommodating . Thoroughly recommended. Very friendly and welcoming hosts. Great breakfasts every day. Fabulous local knowledge and useful tips on things to see and do. Brilliant place to stay - fantastic room, stunning breakfasts and extremely welcoming hosts...couldn't ask for any more. We have been staying at this lovely B&B for a number of years and enjoyed every stay thanks to the welcoming atmosphere from Carol and Mike. The breakfasts are a highlight of the stay with a special choice each morning and the room and facilities can't be faulted with a stylish shower room. We hopr to be back again soon. Located in Downalong area of St Ives so worth asking where the car parks are and directions to the B&B if this will be your first visit. An elegant place, restful, and rich in personal touches. Excellent food, with careful catering for special diets. Most welcoming hosts. Fully recommended. Excellent hosts, Carol and Mike, will visit again. Perfect bed and breakfast, fantastic location, wonderful breakfasts, Carol and Mike are brilliant hosts. Will defiantly stay here again. St Ives has something for everyone. Wonderful beaches, great cafes and restaurants for locally caught seafood and is a perfect base to explore the beauty of Cornwall. Fabulous stay, amazing location and beautiful, well kept accommodation. Breakfasts were absolutely delicious and Mike and Carol were helpful and attentive hosts. 23 will definitely be back! Porth Meor beach cafe and Porthminister beach restauraunt were both lovely! The keep is a fantastic place to stay, a gem of luxury in the heart of st. ives, but due to being tucked away as it is it feels like a haven of peace and quiet. Breakfast is always a treat and Carol and Mike are perfect hosts. Porthmeor Cafe, excellent food, The Digey, perfect for lunch. Visit Barbara Hepworths Garden and just walk on the beach. Super clean, super food, super comfortable, friendly welcome in a perfect location. Porthmeor beach cafe pod was good on a wet night. Seafood cafe a bit different, seafood excellent. Accept Carol and Mikes offer of a car parking space. Lovely walk to Caribs bay. The best hosts ever! So kind and went out of your way, cleaning our room when it was late, providing cushions and blanket for the theatre. Breakfast was gorgoeus (especially Sydney Eggs)and room was large, comfy bed, amazing shower. Cannot fault! Minack Theatre and Porthcurno beach worth a visit. Definitley book a pod at Porthmeor cafe for dinner and watch the sunset. Parking a bit of an issue - plan this ahead of your stay. First class accommodation right in the heart of St Ives. Sea and harbour only 1 minute walk away. Excellent food, cater for dietary issues. Friendly and welcoming owners. Very clean. comfortable,and tidy. The best place we have stayed in St Ives (several visits). Everything in St Ives is "on the doorstep". Perfect. A perfect location in a quiet and level area, convenient for Porthmeor and Porthminster beaches. You couldn't find better hosts -- friendly, helpful, professional and always interesting. It was nice having a resident's lounge/breakfast room with fridge and the breakfasts were delicious, always with the sweetest fruit. I look forward to returning to The Keep. A beautiful place to stay, the most helpful and friendliest of hosts. Nothing is too much trouble. The accommodation is outstanding, the breakfasts divine and the position goes you access to everything St Ives has to offer without having to fight your way through crowds or parking issues. Barbara Hepworth Garden is just around the corner and Porthmeor beach a few yards form your door with walks and wonderful restaurants. Book in advance at Porthmeor Beach café! Carol and Mike were terrific hosts. Carol made the effort to make special breakfasts each day. Mike was helpful with tips on directions and loaned maps to us. Both had a wonderful sense of humour. We really liked them. A central yet peaceful oasis, the Keep is perfectly positioned so you can enjoy the summertime vibe of the lively St. Ives, while also catching some quiet restorative time. Friendly attentive hosts and a delicious daily breakfast make you feel pampered. Very tasteful decor. We will be back, but by train next time. The Loft, just around the corner was great food in a pretty spot and smart modern atmosphere, but a little on the small portion-and-pricey side. We absolutely loved our stay at the keep, Carol and Mike are so welcoming and friendly. They do the most lovely breakfasts with the specials changing daily. We would highly recommend staying here and will almost certainly try and go back. Book a table and Porthmeor cafe, it's on the beach and they do some of the best tapas. The deserts are to die for ! Take a long walk along the coast towards carbis bay and further if you wish. You can always get the train back. You were both delightful - very friendly and helpful; pleasant conversation. Breakfasts were outstanding in every respect. We thoroughly enjoyed our stay and the accommodation was a significant part of that. We appreciated the attention to detail. Book a restaurant table in plenty of time. We enjoyed "Caffe Pasta e Pizza". No booking req'd for Lifeboat Inn - good pub food. We enjoyed the coastal walks and the range of art galleries! Coastal walk is a must, beautiful views! Wonderful hosts with a B&B in a brilliant location. We like it so much we always stay here when fortunate enough to visit West Cornwall. Highly recommend the Porthmeor Beach Cafe. Very nice hosts. Perfect stay. First class room. Super breakfast. Very good tips about Restaurants in the area. Very enjoyable stay. Mike and Carol have obviously put some thought into what their guests might need. Would use this B & B again. I had a facial and massage at "St Ives Skin Care - Attic Cellar". Very good service within a short walk of B & B. Extremely helpful and friendly hosts. Great location and the room was beautiful. Amazing stay, this rises way above a standard B&B. Can't rate The Keep or Mike & Carol highly enough. You leave feeling like you have made friends, rather than just enjoyed a beachside break! This is my 2nd visit and I plan to return again. Beautiful location, by the beach and harbour front / main streets. Tasty breakfasts. Lovely rooms. Personable and friendly hosts. Can't fault. The Mermaid Seafood Restaurant was a quirky and tasty experience. The chips @ The Harbour Fish & Chips also hard to beat for a light fish & chip lunch. Walks around Clodgy Point good to burn off a few calories! good for access to Porthmeor beach and the harbour, the painting school, and a variety of good eating places. Excellent little B&B. The food was cooked perfectly, the room was perfect & the owners were very friendly & accommodating. Thoroughly enjoyed our stay with you. Thank you for making us feel very welcome. Mike and Carol are excellent hosts, made us feel very welcome. The accommodation is first class and the breakfasts were amazing, well cooked and presented, with plenty of choice. We would highly recommend The Keep. St Ives is a lovely place with beautiful beaches. Plenty of places to eat and drink. The Porthmeor Cafe is excellent, amazing views and food. We also enjoyed the Porthminster Kitchen. Superb stay. Beautiful room and bathroom. Really tasty breakfast. Hosts were warm, friendly and helpful. Couldn't recommend a stay here highly enough. I hope to be back soon. Perfect accommodation and hospitality. Lovely owners who looked after us fabulously. Delicious breakfast and outstanding room decor. Perfect in every way. We will be back. Thankyou so much for superb weekend. You have a beautifully appointed b&b. We would recommend you any time. We simply love "the Keep"and especially Mike and Carol! They are so welcoming, helpful and friendly! The rooms are furnished with great style. The breakfast is simply delicous! This was our second stay and we will always come back! No St.Ives visit without a coastwalk to Sennen! Great Restaurants in near reach, ask Mike and Carol! We especially loved the Tearoom this time! I booked a weekend away at The Keep as a surprise Birthday present, after searching through accommodation on the St.Ives Tourism Association. The Keep is a lovely quaint bed and breakfast, hidden right in the centre of St Ives, making it very easy to get out and about. Carol and Mike were extremely welcoming and accommodating and breakfast was outstanding. We had the Mermaid Room, which provided everything we needed, was spotless and had character. Great location for all local restaurants (which include some top quality operations), bars, shops and, of course, the beaches! No need for the car if you are doing anything in St Ives. Fantastic stay. Beautiful accommodation and lovely hosts. Excellent value. 'The castle' we loved it! music and lots of local atmosphere. Had a lovely stay, thanks Carol and Mike. Great hosts! Coast walk to Lelant was very nice. Lovely welcome to your beautiful home. Wonderful breakfast choices especially the daily specials. We loved the location of The Keep. St Ives is amazing, we also walked to Lelant, a beautiful walk. Lizard was spectacular but a bit of a drive away....so much to see, take your pick! Lots nice restaurants and tearooms. St. Ives bakery supplies superb daily bread. We have come here twice a year for the last 5 years. It is our favourite place to stay. Carol and Mike are always very welcoming and each time we go have new suggestions of places to visit or restaurants/cafes. However we rarely need lunch as the breakfast is superb and keeps us going. Each day there is a new breakfast special to try. Carol and Mike offer discreet and excellent service. The room is beautifully decorated and very comfortable. 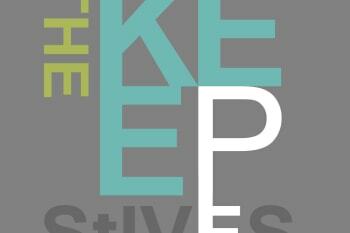 We cannot recommend The Keep highly enough. Visit it once and you will return like us ! We received a very warm welcome after a difficult journey to St Ives. Next time, we would very much like to stay a few more days to enjoy the peaceful and beautiful Keep ! Many thanks for your hospitality and good recommendations - we had a lovely stay in Cornwall ! In St Ives, The Porthgwidden Beach Cafe served us an excellent meal.. Drive down to Zennor and Cape Cornwall. Porthgwarra is worth a visit, for the scones and tea at the small cafe, and the access to stunning walks along the cliffs. The Rock Pool Cafe in Mousehole was cute and have a delicious crab sandwich. End the day enjoying sunset at St Michael's Mount..
Lovely hosts, spotless first class place to stay. Thought St Ives could not get any better, but it did we stayed at "the Keep. Mike and Carol are just lovely. We like the Sloop, boss burger bar and the Hub never lets us down. very friendly and welcoming. Comfortable well equipped room and great breakfasts. Perfectly situated for visits to the Tate and other art galleries. Close to the beach and the harbour with many restaurants to choose from. The Tearoom, as recommended by Mike & Carol is a must! Porthmeor Beach and its cafe also on the things to do. Lovely walk along Clodgy view and over onto Zennor coastal route. The Sloop for the oldest bar in town. Scoff Troff was also good for a tasty lunchtime retreat! Excellent, Mike and Carol were very friendly. There were tasty specials as well as all the usual options for breakfast. Very conveniently located for the Tate and very many good restaurants. The modestly named 'The Tearoom' was our best evening restaurant. Good service, good food. We've stayed in a number of B&Bs and this was by far the best. We were warmly welcomed by Carol and Mike who were the perfect hosts. There was not a thing that had not been thought of and the rooms were immaculate. 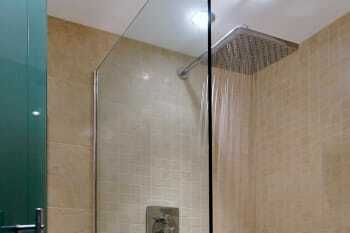 The designer showers are also amazing! Breakfast was delicious each morning, they also have a Special option which changes each day. The location is ideal - walk for just a minute or 2 and you're on the beach or at the Tate. I could not recommend this highly enough. Would definitely come back again! Mike our host recommended a lovely restaurant called The Tea Room which is in walking distance. Fantastic place if you are looking for quality food. If you are after a pub meal I recommend the steak and ale pie at The Sloop Inn! Of course there are plenty of galleries, shops and the Tate on your doorstep. Great location for bars shops restaurants and beaches. We'd recommend to go for a boat trip to see seals. It's just £12 per person and lasts an hour and 15 mins. Even if you won't see many seals you'd definitely enjoy the trip. Also we'd recommend to visit St Michaels Mount. It's a castle on a top of a mountain which is located on a small island. For National Trust members entrance is free. This was our first visit to St Ives and our fist stay at The Keep and it won't be the last - we could not have chosen better. Our hosts, Mike and Carol, made us feel very welcome and nothing was too much trouble, including some great local restaurant recommendations. The breakfasts were amazing with a wide variety of choice including a daily special, which was a lovely touch! Location wise The Keep could not be better, 2 minutes walk and you are at the beautiful Porthmeor beach where we lucky enough to witness the most breathtaking sunsets we have ever seen. We would not hesitate in recommending The Keep to family and friends and would love to stay here again when visiting St Ives next. giving in the highest Recommendation. Thank-you once again Mike and Carol for your hospitality! Visit the Tearooms, lovely food. Welcoming, helpful, great breakfast and just made that extra effort. For great food. The Bean Inn at Carbis Bay. A must if you are a vegetarian. Also coastal walk. Suburb, excellent stay, this was our second time and will not be the last. loads of nice restaurants, lovely bay, shops, walking etc. Beautiful little b&b tucked away in the alleys of St. Ives. Absolutely amazing hosts, Carol and Mike are very friendly and helpful. The pancakes were delicious! I would definitely recommend and I hopefully get the chance to stay again next time i'm in St. Ives. Enjoyed a great three night stay in the mermaid room at the keep. Mike and Carol were the best hosts and the experience had a really personal touch. 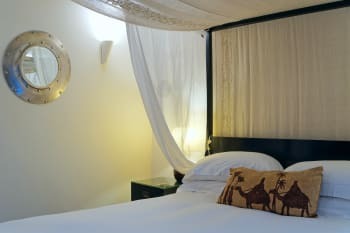 The interior is beautiful, the mermaid room was really comfortable with a fab shower and the location almost amidst the town and a stones throw from the beach was brilliant. Oh and the breakfast delicious. Highly recommend this little gem of a B&B. Thank you so much for being such wonderful hosts! We truly enjoyed our stay, and your recommendations were the best. Main tip to future travellers: listen to what Mike and Carol say! They have the best recommendations for places to eat and things to do. Lovely accommodation in a great location. Made to feel extremely welcome and breakfast is top notch. Will definitely stay again. Carol and Mike cannot do enough for you. Their local knowledge helps to plan a day out when you are new visitor. Both Richard and I found you wonderful hosts, friendly, witty, warm and welcoming. We would absolutely love to come back to stay and for longer this time. Plus the French Toast breakfast alone is worth travelling 450 miles for! Thank you for helping to create wonderful memories and an extremely relaxing break. We ate at some fabulous restaurants with amazing views. The Alba is excellent for modern dining overlooking the harbour, whilst the Tea Room does a wonderful cream tea and cheese platter. If you want relaxed dining at the beach then Porthmeor Beach Cafe is the place to go or maybe The Hub for a great burger. We felt spoilt for choice! The walk between St Ives and Hayle is beautiful, hugging the coast line it is a great way to see the local wildlife and scenery. If you are feeling really energetic then Richard enjoyed surfing at Porthmeor Beach, which had great clean waves whilst we were there. Just ask Carol and Mike. Always brilliant advices! Just returned from a week at The Keep. We were looked after exceptionally well by our hosts Carol and Mike who were always helpful, friendly and made us feel very contented with our choice of accommodation. Lovely breakfasts with plenty of choice and a daily 'special'. 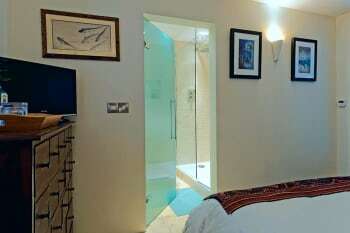 We stayed in The Mermaid Room which was tastefully decorated and had a great ensuite shower room. The Keep has easy access to all that St Ives has to offer. St Ives is very beautiful and it was our first visit. There are plenty of good restaurants and cafes. We particularly enjoyed Olives for lunch and The Porthgwidden Cafe in the evening with the lovely view over the beach. We had great food though wherever we went. Watch out for the gangster activity of seagulls when they steal food! We loved to wander through all the many streets between the houses discovering little galleries and art studios. St Ives is a great base to explore the rest of Cornwall. Parking is an issue generally but Carol and Mike were very helpful and a big thank you to them. Would have loved to stay longer as there is so much to enjoy. Even when busy St Ives makes you feel calm and relaxed! Very, very pretty. Lovely B&B in St Ives. Thoroughly enjoyed my stay. Cooked breakfast was a treat and top class accommodation. In addition to Carol's fantastic recommendations, we took a day trip to Minack Theatre by bus for the day and was a good alternative option to the coach.. Lovely glass making jewellery demonstration in the alley off Fore St.
A special occasion made more special by lovely accommodation, scrumptious breakfasts and such friendly host & hostess. We hope to return soon. The accommodation is in a very central part of the old town very near beaches, shops, restaurants & The Tate. Try the Porthmeor Cafe, which is more than a cafe, and has the most stunning views of the sea, whatever the weather. It was an idyllic 3-day stay enjoying excellent breakfasts, tastefully decorated and comfortable accommodation perfectly positioned to enjoy St Ives' delights. Carol and Mike are perfect hosts providing all possible assistance to ensure a wonderful stay in the area. The Keep will be my first choice on return to St Ives. Twice during my 3-day stay I enjoyed dining at Pasta Cafe. The carbonara was the best I ever tasted, the house white and red wines enjoyable, the service excellent and price most reasonable. Seafood Cafe disappointed with inflated prices, small portion of fresh fish, forgettable chips, insipid house wine, and indifferent service. This is a restaurant I shall avoid in future. A mediocre South African chenin blanc selling for £2 in South Africa appears on the wine list at £15.95 per bottle. We loved our stay, it felt like getting away from it all but home from home.We loved all the personal touches which made us feel really welcome. Location couldn't be better either. The cooked breakfasts were yummy! The rooms are beautifully decorated and furnished but the icing on the cake was having yourselves as our warm and friendly hosts. Beaches are beautiful of course. We ate at the Seafood Cafe, the steaks were fantastic. Fantastic B&B, great location, lovely and clean. Gorgeous breakfast and all delivered by friendly and attentive hosts, Carol and Mike. A little gem that I hope to visit again. Fantastic location for restaurants, seafront and beaches. For those that surf or board Carol has a small drying room to hang wetsuits etc. in. Far too many restaurants to mention but it is advisable to book a table, as it gets very busy in the main holiday weeks. Lovely B&B, would definitely recommend to others (already have!) The only thing I missed was a full length mirror in the bedroom but that is a minor detail and it wouldn't put me off booking it again in the future. Absolutely charming B&B in a brilliant location for the shops and seafront. The attention to detail in the room is amazing. Flowers in the bedroom and bathroom and chocolates on the bed. Very modern room which was very comfortable. Breakfast was wonderful with difference specials every day. We would definitely stay here again without hesitation. Carol recommended the Portmeor Café on the beach. We booked a pod and had fantastic views out to sea. The food was very very good and not expensive. The Sloop pub on the front is a must to sit outside and people watch. Tate Gallery is very interesting. Lovely place, and lovely hosts. Mike and Carol treated us beautifully. It was our wedding night and they treated us to some lovely personal flourishes which were very touching. Scrummy breakfast, comfy bed and amazing shower. Felt more hotel than B+B. We extended our stay it was that lovely. Wonderfully relaxing secluded venue right in the heart of st Ives. Charming and welcoming hosts that made our stay perfect. Great local knowledge and fabulous suggestions for local dining. We would love to go back if we get the opportunity to. Porthmeor beach cafe and the tea rooms on the harbour for dinner. Great scones at the Digey tea rooms. Truly an exceptional stay. The room was lovely, breakfast was delicious, location was fantastic and best of all, amazing hospitality from Mike and Carol! My partner was unwell on the last day and both of them allowed us to extend our checkout until she was better. Highly recommended. Location is fantastic and so near to everything! The Tearoom is always nice and the Hub is always a great place to wind down after a day of sightseeing. This was our first time visiting The Keep and it certainly won't be the last. 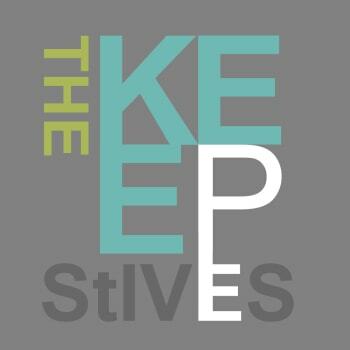 We have often stayed in St Ives but from now on there is only one place we want to stay and that's here at The Keep. The rooms were spotlessly clean and modern and yet there seemed to be quirky little touches here and there that kept surprising us in memorable ways. The owners Mike and Carol were so friendly and couldn't do any more to make us welcome. They offered us advice about locations to visit and restaurants to try in the evenings and when it came to breakfast, well what can I say... I had a beautifully cooked full English however my wife, who doesn't eat much, was offered an array of choices. Carol even offered specials such as scrambled eggs with smoked salmon and especially for my wife, homemade pancakes with fresh berries and syrup. I whole heartedly recommend this sumptuous B & B, although I know that this may now mean I could struggle to find a vacancy at my favourite little spot in St Ives. So I best book early from now on. The Keep is the place to stay. It IS a walk from the train station so if you have a lot of bags probably worth getting a taxi. Loads to do though even in the winter - St Ives does not shut down! Excellent place to stay. Very friendly owners who are extremely helpful. Porthmear beach restaurant is close by serving excellent food. The Mermaid, a small bistro restaurant in Fish Street, was superb. The warm welcome, service and care were faultless. We appreciated being made to feel at home from the moment we arrived. Take good walking shoes as the walks are fantastic. Definitely visit The Barbara Hepworth Museum.